This document is a template agreement designed to form the basis for a version suitable to your circumstances. It covers both the loan of a horse or pony for any purpose. However, it is a good idea to specify the purpose of loan because by doing so, if the borrower uses the horse for something different, he is in default and you can demand the return of the horse. Lending to friends and family can be difficult. A written agreement may seem too formal or raise questions of trust. But not using one can result in confusion about the terms, or mistaking the loan as a gift. This agreement is simple in order to bridge the gap between not using an agreement at all, and using a longer, more comprehensive one. It is, however, legally binding. 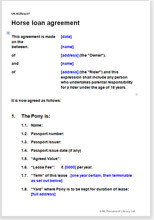 In this document template we have made the deal for free loan. Purpose of the loan / use of the horse. Miscellaneous legal matters to protect your interests.